Well, It is not exactly Thailand, but another hour on the plane and I would be there! My first mistake was to think that I should stay away from Cenang Beach when I booked my hotel. 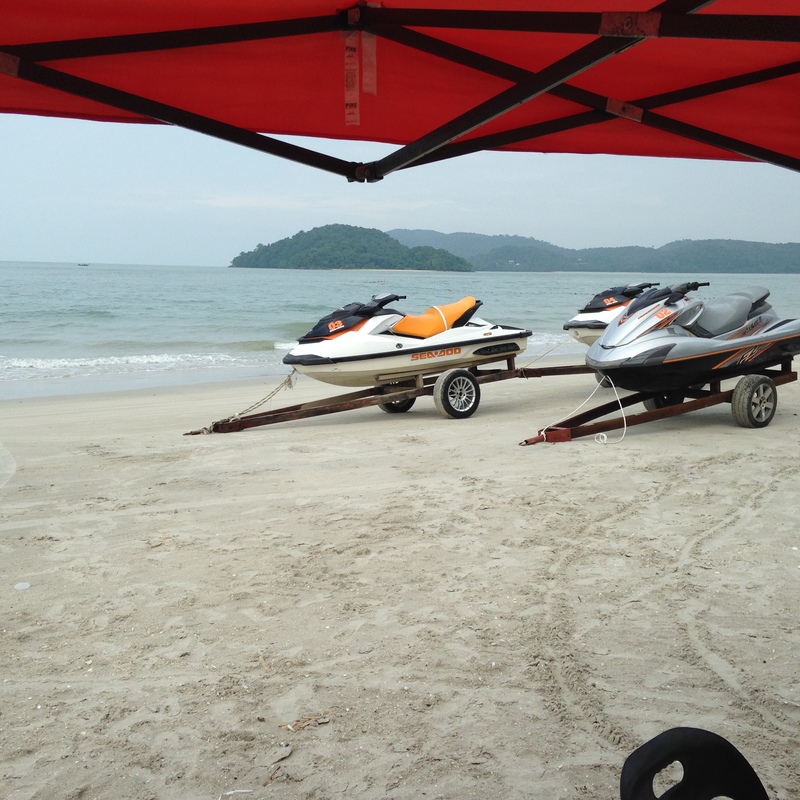 Malaysia does tourism well, and it is the “rainy” season, so the beach was not crowded. I stayed in the G Motel in Kuah. Terrible location, but I am not complaining. I got there in the morning, and before I could frighten myself out of it, I rented a motor scooter. I do not know why that little vehicle scared me so much in the beginning. Perhaps riding left-side in a congested city-port had something to do with it. I located the most remote beach on the map and headed north across the island from Kuah to Tanjung Rhu. There I found paradise. Where does one go from here? The water was turquoise, the sun strong and the boat traffic was minimal.Giant mini-mountains rose from the sea, and women drifted behind their me n in black burkas. This practice still fascinates and mystifies me.I spent the day lounging about, taking occasional dips in the warm Andaman Sea. By the time I came back, I was so hungry, but I needed a break from the scooter. Kuah is not exactly the eating capital of the world, so I settled for some sketchy local food, which means a corrugated cover, open stove, cooking something unidentifiable, and little to no English spoken — a mom and pop operation. So I just pointed to the best looking picture on the menu and ended up with unshelled prawns with the fuzzy little legs still in swimming position and processed squid, covered with the hottest sauce you can imagine, on a bed of noodles. After the first bite, I was not so sure that I could eat it, but I felt committed and sloshed it down with a rather dirty looking cup of water. I shooed away the ants and the flies and hoped that I hadn’t just ruined my vacation with a gastronomic mistake. The next day, feeling more relaxed on my scooter, I motored to Cenang Beach, found some delicious coffee and tamed my queasy stomach with some bread. Cenang Beach was where it was happening — jets skiing, paragliding, food, and five star hotels. I managed to lounge in a five-star chair for most of the day, until they figured out that I was a lowly moocher, and shooed me away. I had signed up for a jet ski that day, but the tide was so low that the boys in charge suggested I come back in the morning, so I satisfied my hamburger craving and scootered home. The morning of day three looked a bit ominous, so I got on my scooter to beat the rain and go to Cenang beach, because I did not want to be stuck on a rainy day in Kuah. I made it to the coffee shop before the deluge. I diddled about looking for things to do on a rainy day, and before I knew it, the rain stopped. I hurried to the jet ski guys, and they were good to go. Everyone speaks English here, but the Malay English accent is almost another language in itself, so I just waited to see what was going to happen. I did not know if I was going to drive a jet ski, or if someone would drive me, or where I was going. It is best to wait it out to see what comes. Finally, we were ready to go, and I think they were going to send me off to explore the outlying islands alone, which was fine, until I asked them how to drive the jet ski. So one of the guys let me drive. and we headed out to the islands. Wow! I definitely caught some serious air. Then the guy in the back asked me if I wanted him to drive, so I gave up the wheel. I thought I had been going fast. We flew! He took me from one remote island to the next. I tried snorkeling, but the water was murky, so I just swam around at each stop. Then he took me to a place where there were hundreds of eagles swooping around as tourists fed them. It was an eagle feast. Before I left on the jet ski adventure, I held a girl’s adorable baby girl. As I was talking to the mother and her friend, they asked me what I was doing. I told them about my travels, and they were in awe that I was travelling without a man. Where is your husband? I got that a lot on this trip. The woman said to me, “you are so brave.” When I asked her what she was doing that day, she said paragliding. I am not so sure about her perspective on bravery. I decided to end my day with a cable car ride. I scootered along the southeastern side of the island and up a winding, steep mountain road. There were families of National Geographic monkeys, with fringe framing their faces and babies hanging onto their bellies, lounging everywhere! I made it to “Oriental Village”, which is as touristy as it sounds, but it was too late to turn back. 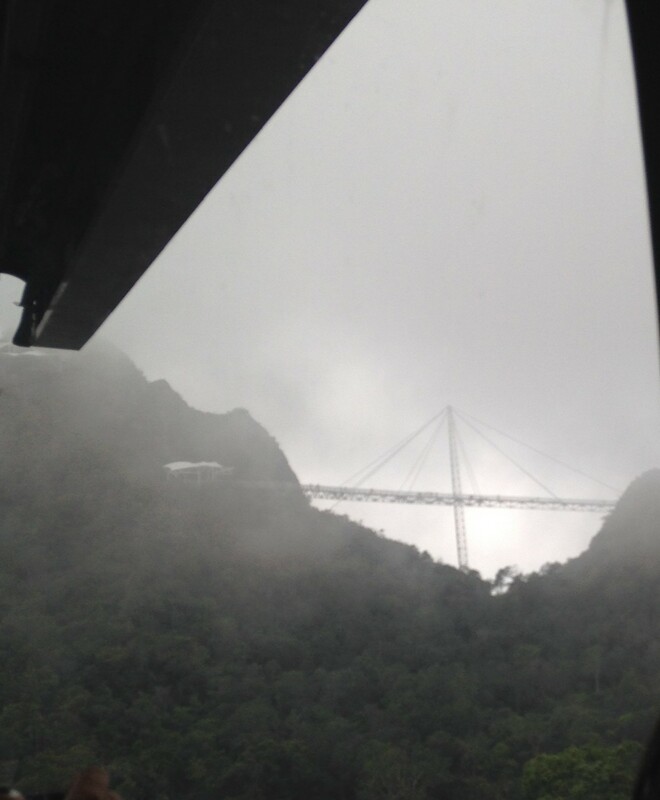 I found the cable car and travelled to the top to explore the sky bridge. It was as murky up there as it had been in the ocean, but it was worth it. I returned to Cenang and indulged in some delicious Indian food. I thought my plane was leaving at 10:40 AM the next day, so I returned my scooter and took a taxi to the airport only to find out it was a 10:40 PM flight. What a treat. So I rented another scooter, drove around the entire island looking for Pebble Beach, to no avail. I kept running into exotic hotels and golf resorts, which would not let me in. I spent the rest of the day at Cenang beach, and was blessed with an incredible sunset. At low tide it is possible, if you have water shoes, to walk through ankle deep water to the other island across the way. People just sloshed about finding shells and taking in the sunset. I still enjoy Malaysia. I work every day from 8:30 to 6:00. I still enjoy the work, and I am learning a lot about language. I love playing and talking about words. I have joined a writing group and I am taking yoga classes daily after I work out in the gym. I am amazed at my progress in yoga. It helps to have the strength and endurance to do it properly. This morning I played tennis with a woman, named Krishna, for the second time . I cannot think of any place that she has not lived. She is in KL while her husband builds a golf course! After a hot, hot, hot set of tennis, we ambled about the local mall and discovered bookstore and a much better grocery store than the one I frequent. I am enjoying taking it easy this weekend. I am still relishing in my serenity and solitude here. After living in a new country, you come to a point where things are not so surprising and different. I take the KLA (monorail) without wondering why I have to scan my card twice, or laughing at the sign that saves seats for the elderly, pregnant, or child carriers. I am okay with having my coffee with full cream milk instead of half and half, and I know to take an umbrella wherever I go. I can sleep through the 6:00 morning prayer, and I still love having people open the door for me downstairs. Little things do fascinate me. Women in headscarves at the gym, the shoes people wear, and why I still do not have Internet. You cannot be afraid of parasailing not with all that you are doing that would make me hesitate if not run away from it. Pete and I parasailed in Mexico years years ago. It was offered from the beach in Ziwatenao and we looked at each other and said “WHY NOT- the children are grown, our wills are in order and we have insurance to fly us back to the US in case of an accident.” We loved it. Ok I don’t even know what to say about the lavatory instructions, but this blog absolutely confirms you’re having the most amazing experience! 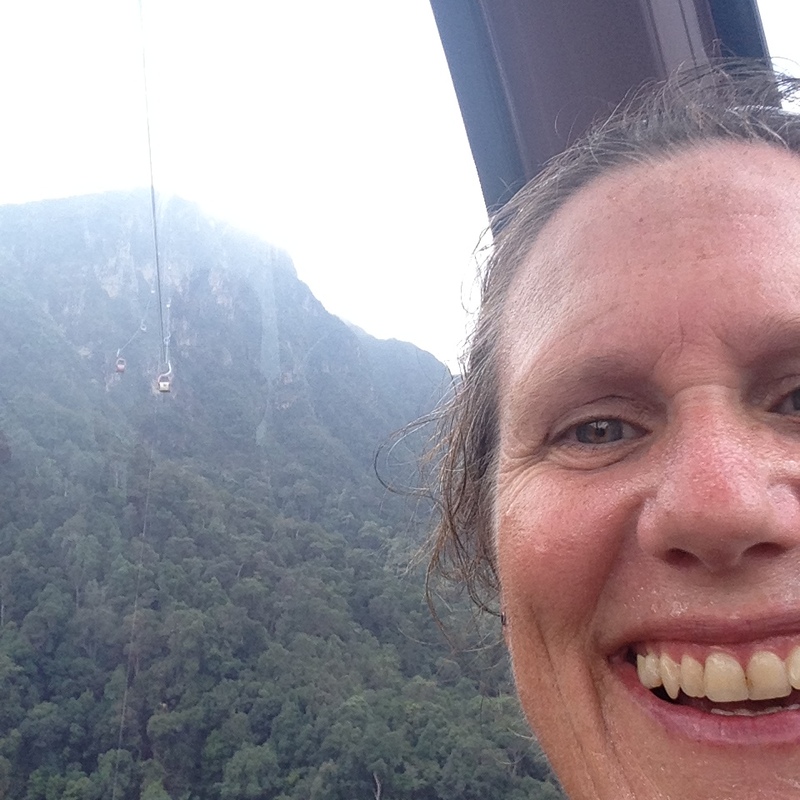 Thanks for generously sharing it with all of us who aren’t able to follow in your adventurous footsteps, Lisa!